Try it yourself to experience it’s rich flavor and fine quality. Our many loyal customers will tell you they recognize Lou’s distinctive rich flavor that distinguishes it from all others. Lou’s Gourmet Sausage is a family-owned company, which takes great pride in producing the highest quality. You can have a quality, mouth-watering meal in a hurry for the family “on the run” who love quality meats. Select one of our recommended recipes on our recipe page and surprise your family with a tasty gourmet dining experience in your own home. The aroma of the delicious meal will stop your family in its’ tracks as they enter. AND a meal for four for less than ten dollars. Consider the freshness of our products. Lou’s Sausage is on the store shelves within hours of being made. QUALITY, FLAVOR, FRESHNESS AND VALUE SINCE 1954. Enjoy Lou's Sausage at Progressive Field while enjoying the tribe games this season. Lou's Sausage can now be enjoyed at Progressive Field while you are relaxing and watching the Indians battle the best in baseball. Weather you are in the plush environment of a loge, or enjoying the game at the Terrace Club as well as the new Right Field section you can now make the game just a little better. 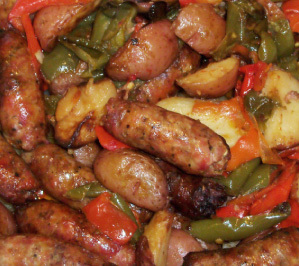 Take the opportunity to treat yourself to the mouth-watering pleasure of Cleveland's Own Lou's Sausage. This hometown favorite sausage combines with our hometown baseball team, what a great way to spend the day!